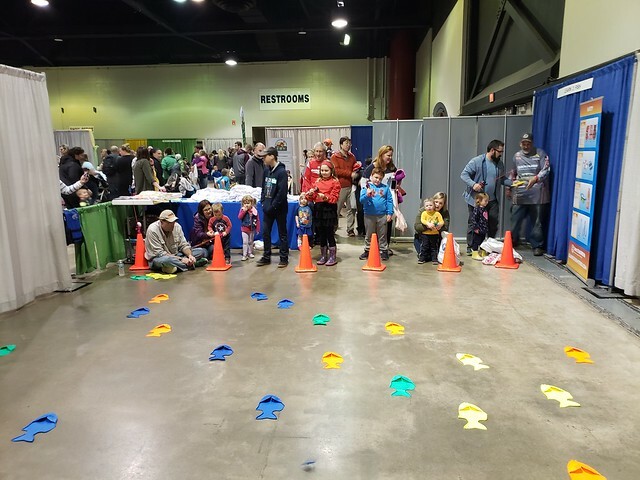 This past weekend Learn 2 Fish With Us attended The Big Event, which was held at Shopko Hall in Green Bay, Wisconsin. This was a fundraiser for Encompass which uses their proceeds from the event to provide the finest quality early education and nurturing care to all children, regardless of their economic circumstances. 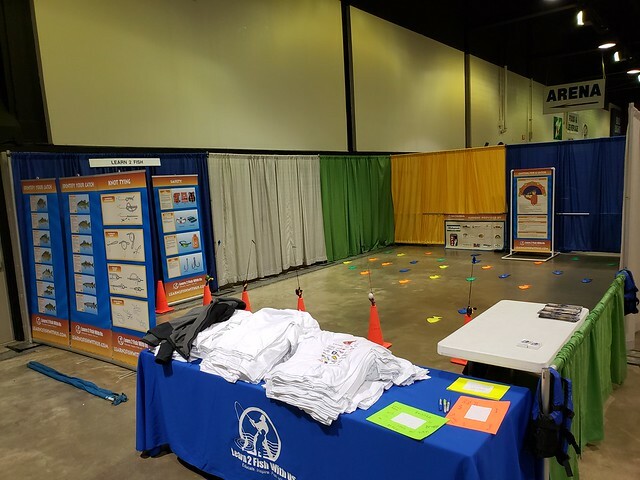 Based on this, we believe Learn 2 Fish With Us fits in with their vision by creating a healthy mind, by introducing youth to fishing and the outdoors. 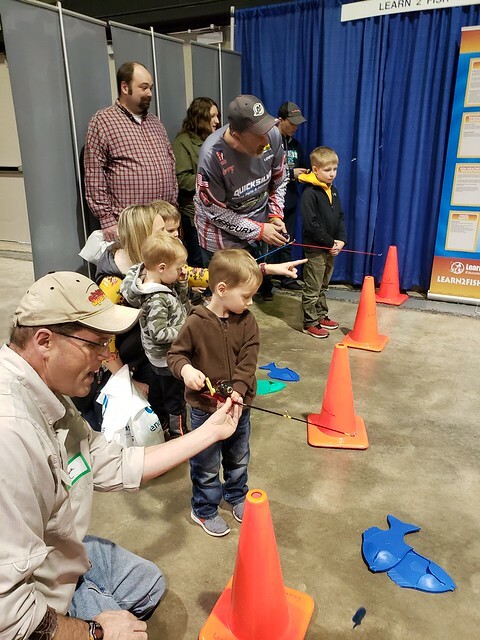 Learn 2 Fish With Us and NPAA Member Greg Karch #121, Larry Redmann #1298, Board Member Mark Moran and other Learn 2 Fish With Us volunteers, educated youth ten and under to the skills of casting!! Many Backyard Bass were caught during the event. Youth in the booth were taught to point their Shakespeare fishing combo at the fish and then look behind them so they don’t hook anyone. Next, press the button and hold, go to 2 o’clock over their should, then proceed forward to 10 o’clock and release the button. The final step was to turn the handle which locks the reel and then start reeling in to hopefully catch a Backyard Bass. 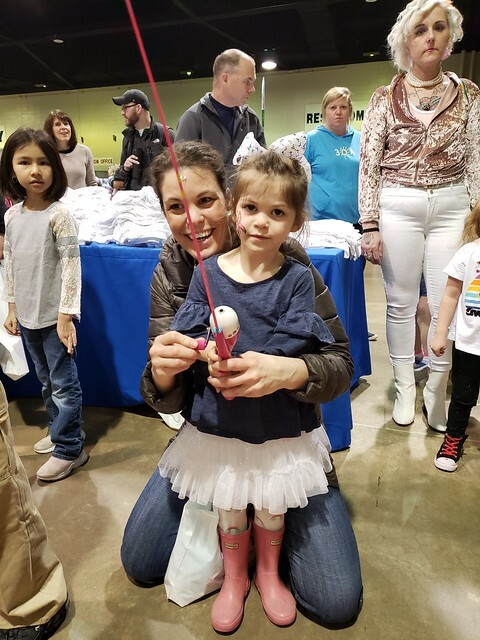 Learn 2 Fish With us educated nearly one thousand youth to casting, making this one of Learn 2 Fish With Us top ten events in the last eight years. 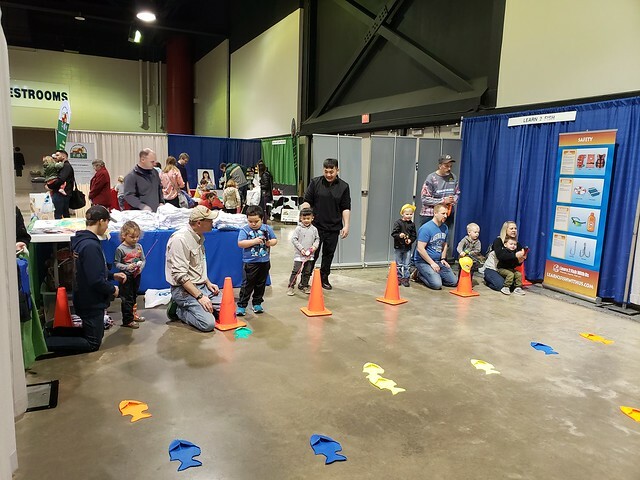 The average age of youth entering the booth were between four to six years old, making this the youngest Learn 2 Fish With Us audience for a fishing clinic. Learn 2 Fish With Us really appreciated the volunteers that helped at the event, as this would not have been possible without them!! A huge thanks to all our sponsors for helping to provide goodies for the youth. Thanks to Greg’s and Learn 2 Fish With Us sponsor’s: National Professional Anglers Association, Shakespeare, Berkley, Dave’s Musky Club, Thrivent Financial, Writing By Design LLC; Mercury, Triton Boats, Future Angler Foundation, The Boat Doc, Off Shore Tackle Company, Plano, Northland Tackle, TTI Blakemore Fishing Group, Bass Pro, Maui Jim, Mad Wraps LLC and The Reel Shot as these events would not be possible without their support. Is your group looking for a fishing clinic in 2019, send an email to Greg at CaptainGreg@Learn2FishWithUs.comand he will get in contact with you. To learn more about Learn 2 Fish With Us check out our website at www.learn2fishwithus.com .